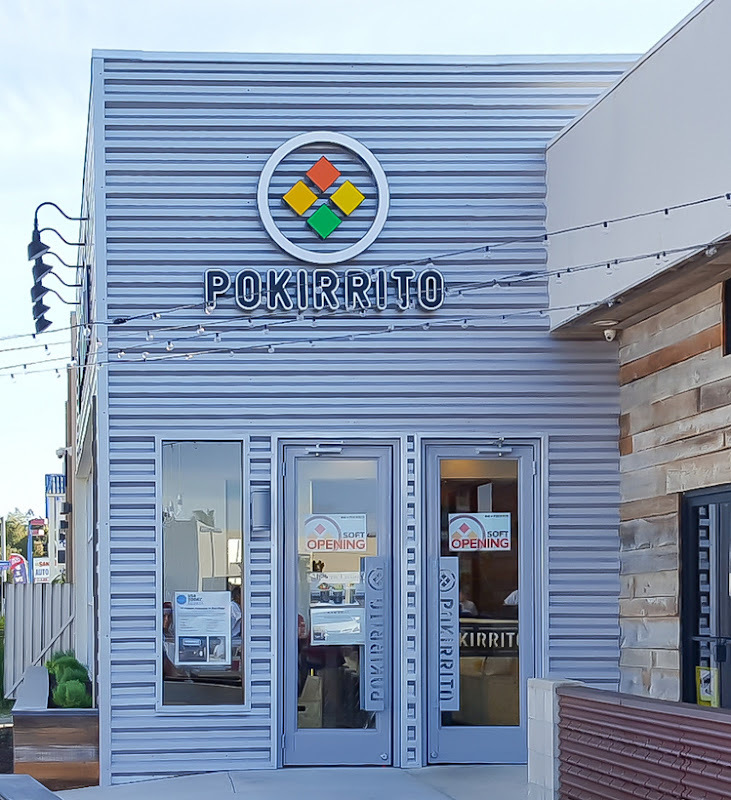 Pokirrito, a fast-casual restaurant by the owners of RakiRaki, specializing in poke bowls and sushi burritos, has finally opened. It’s been nearly a year since I first started following the progress, so I was more than a little excited when they finally soft opened last Friday. 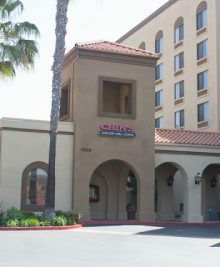 We happened to be in the area and went to check it out. 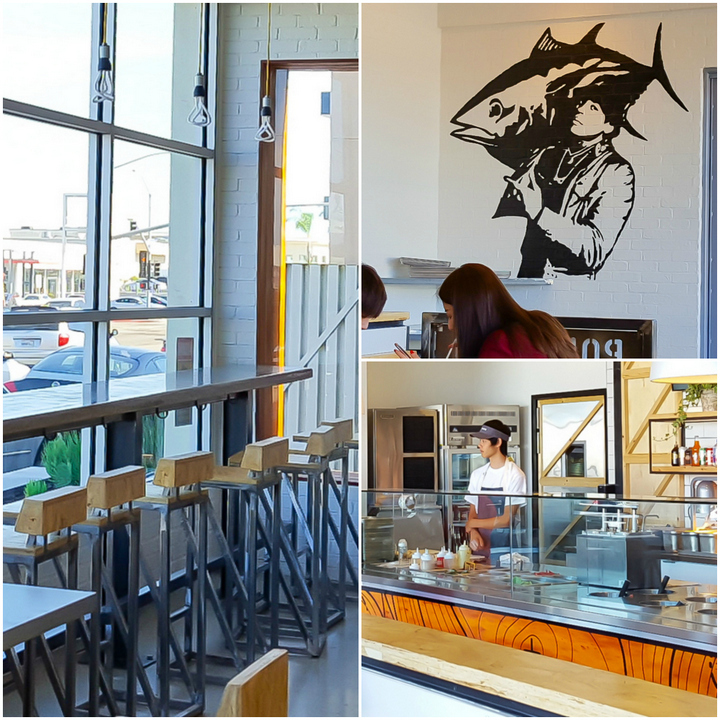 Located adjacent to RakiRaki, the interior is quite nice, with a lot of natural light, windows, and seating. 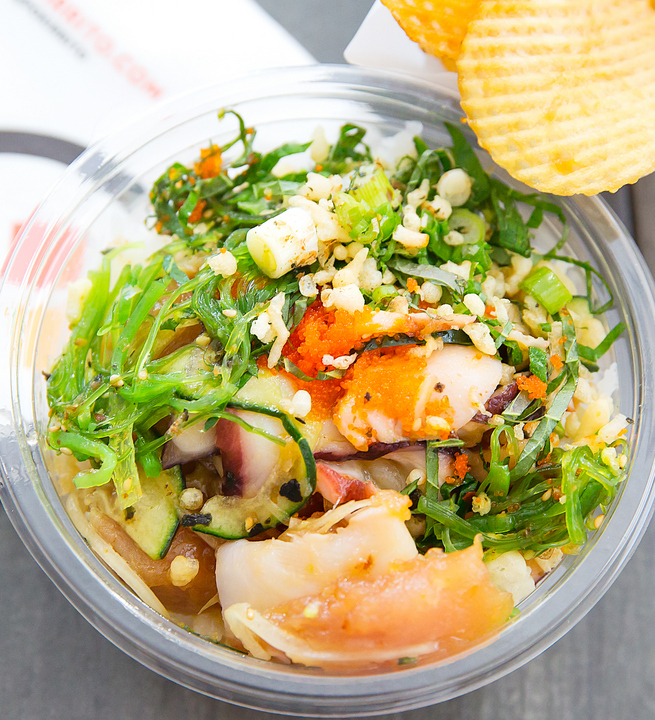 The first part of the line is dedicated to their made-to-order poke bowls and the second part is for the sushi burritos. We decided to try both the poke bowls and the burritos. 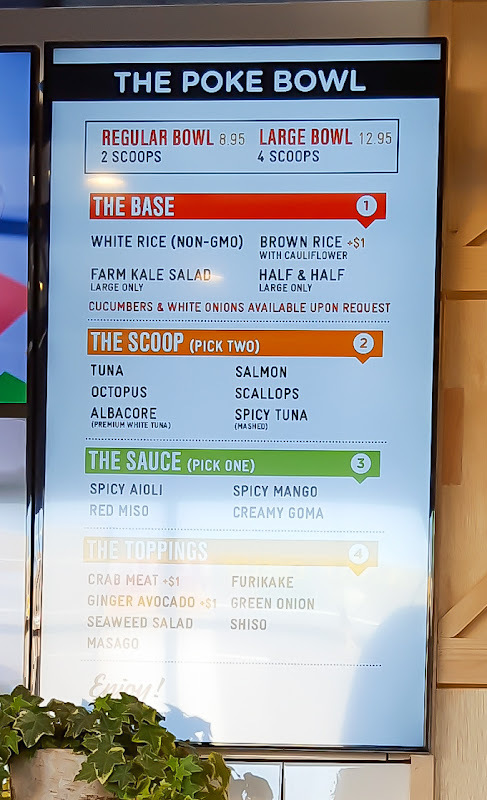 For the poke bowls, I was really pleased by all the options. 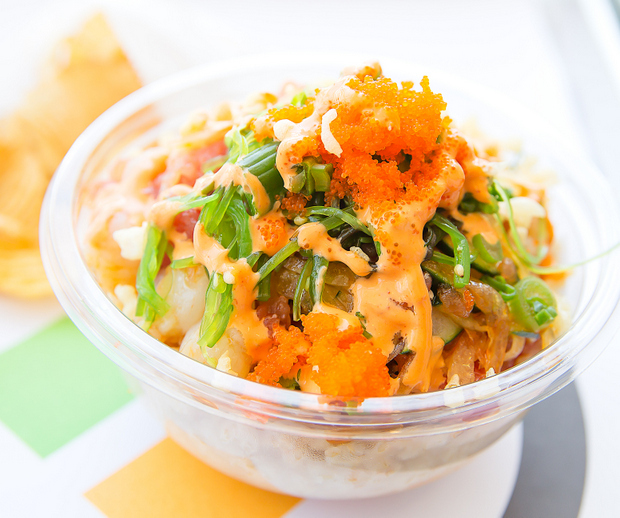 Poke Bowl: brown rice with cauliflower, spicy tuna + scallops, topped with masago, seaweed salad, scallions, crunchy topping, and drizzled with spicy aioli. This looks a little messy because everything is piled on to of each other. While in line, I saw a large bowl being plated and realized it made for a better presentation as you can see all the ingredients better. 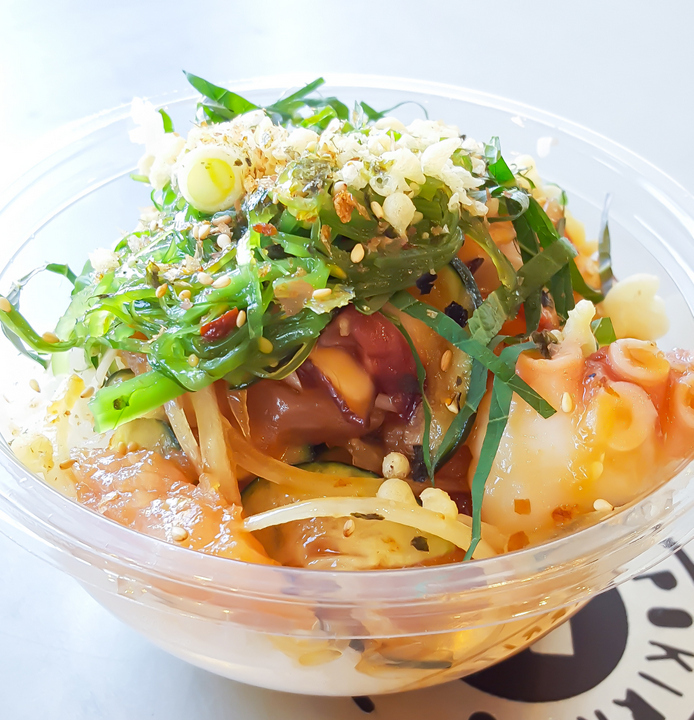 We actually went back Sunday to try a large bowl and in hopes of getting a better photo, but unfortunately, they were out of large. Doh! It’s only temporary though and we were told they would have them again on Monday. All orders come with a side of lattice-cut potato chips. 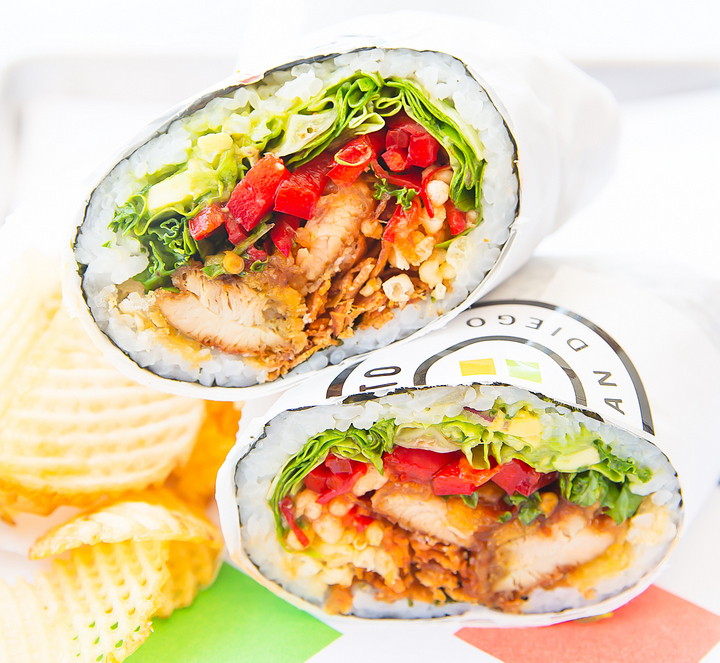 For the sushi burritos, they have several pre-designed ones for you to choose from. All of them sounded quite delicious and it was fun watching them expertly make and roll these burritos. RakiRaki’s chicken karaage, fried ginger, butter lettuce, ginger avocado, kale, red bell pepper, lotus chips, shiso tempura flakes, sweet chili soy sauce. We’ve now tried sushi burritos at three places in San Diego and Pokirrito’s version is by far the best presentation and also the most substantial. I loved how you can clearly see every ingredient in the cross-section. The burrito itself was flavorful and well balanced. 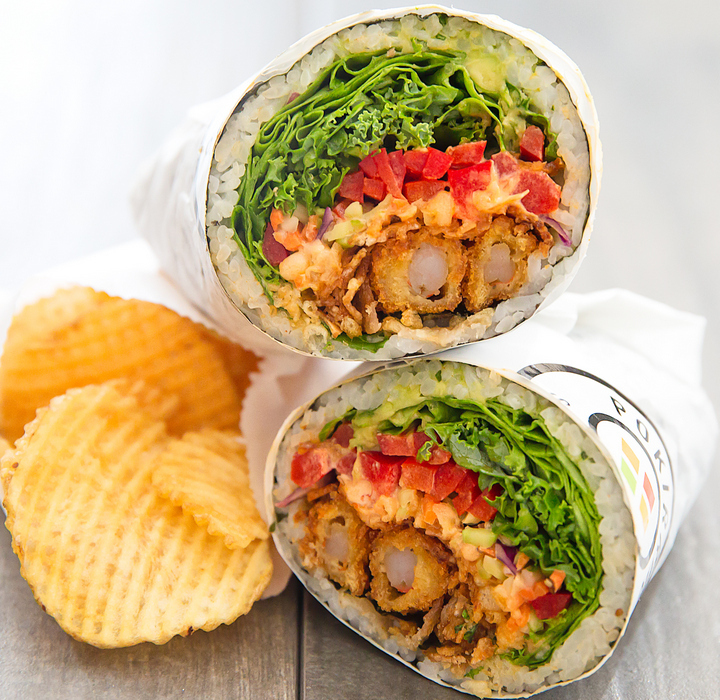 The seaweed wrap did get soft fast, but that tends to happen with these burritos. Shimp Panko-Katsu, butter lettuce, ginger avocado, kale, broccoli slaw, red bell pepper, lotus chips, shiso tempura flakes, orange honey aioli sauce. On our first visit, we got our food to-go. I loved the presentation and colors of the Kahala Sunset and only wish I had better light to capture it with. Because we got this one to-go, the lid smashed down the top. Since it was our first visit, I was pretty overwhelmed by the choices and when we got to the toppings, I just asked for everything. It didn’t make for a good picture, but it did give me a better idea of what I liked for my future visits. Overall, we were really pleased with our initial two visits here. Things were busy this weekend, but the lines moved relatively fast. Even though many of the employees are still in training, I thought things went fairly smoothly. We’ll be back to try work our way through the menu. 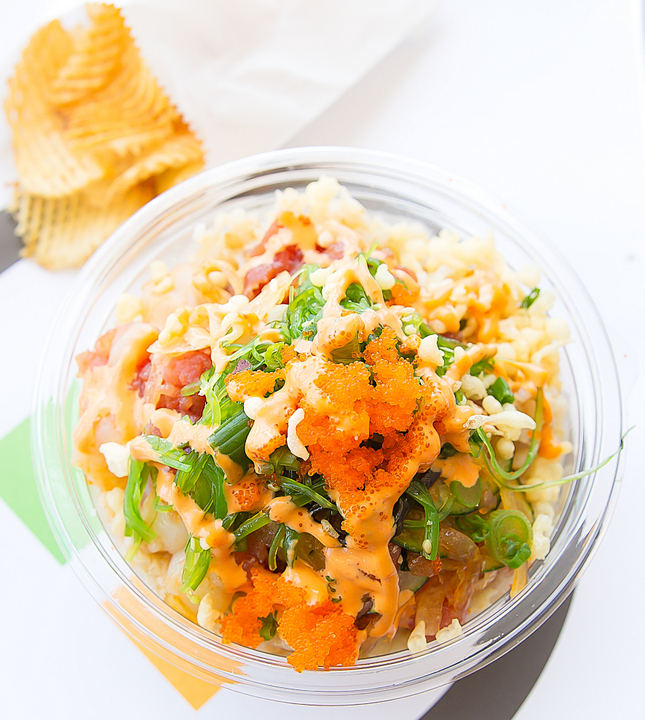 I am quite curious about the kale-based poke bowl. P.S. 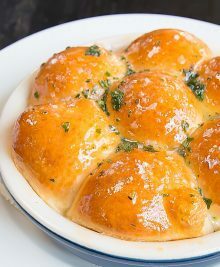 Check out my updated post here with more menu items including skewers! Very nice! The bowls look so pretty with the toppings.